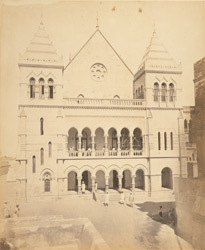 Photograph of the new palace at Bhuj in Gujarat, taken by an unknown photographer during the late 1870s. Known as the Prag Mahal, the palace is one of three in Bhuj and was built in c.1865 by Rao Pragmalji (ruled 1860-1875). It was designed by Colonel Henry St Clair Wilkins (1828-1896), a Royal Engineer, in a Venetian Gothic style similar to two government buildings in Bombay also designed by him at around the same time, the Secretariat and the Public Works Office. A clock tower 150 feet high was connected to the main building by covered galleries. This is a view of the front façade of the palace.